Starting to get those thoughts of doubt, those self-defeating introspections that build over the week heading into race day. Being only a night from toeing the starting line, those inner voices are starting to concern me – did I train enough, are those dull body aches something to be concerned about, is it really going to be that hot, Linda will not be there – what happens if I get hurt and on and on. Something to be said about the numbing effects of repetition – since this happens so regularly, I eventually get past it and remind myself that a) I chose to do this and b) I train really hard for these very days. Wait, that isn’t me reminding me of that, it’s Linda when she gets tired of hearing me whine about it hehehe,. Truth is, there is a bit of extra jitters on this one. If you remember, I previously mentioned I signed up for “a new endeavor” in the realm of self-inflicted pain – that reality is tomorrow. Will have to let you know how it goes in a future post … if by some miracle I survive. To help get those nerves in check, thought I’d crank out a post. What to post on, hmmmm, oh wait.. no…well, awwwwwwe yes, let’s go with another new bird from our recent trip to the Rio Grande Valley region. Bet that caught you totally off guard – not! Enough with the delay, let’s get to the bird..
Hit the jump to find out what this punked up bird is. I’ll give you a hint, the official name of this bird would stump even the most savant Wheel of Fortune enthusiast out there and guaranteed to produce a stickman suicide in any game of Hangman. Side question, do kids even play that word game these days or has the snowflake generation decided it is too macabre? Back on topic (was simply stalling to give you a chance to figure out what this bird is). Unless you really know your deep South and Central American aviary, you probably are not going to get this one – I will give you credit if you said “some kind of dirty Cardinal”. If you immediately blurted out “that’s a Pyrrhuloxia” then from one birder to another “damn, you’re good!”. I on the other hand, had no clue what this was beyond knowing it was a new bird on my list. This specimen was found while exploring the Harlingen Thicket World Birding Center in Harlingen, Texas. This location wins the most accurately named bird site I’ve visited to date – it truly is one big thicket – great for birds, not so great for photographers. The only way I found this bird was due to it flying right past me before landing deep into the mesquite. It took yeoman effort to find a gap in the branches to actually get something in the tin. The amount of bits that hit the floor in the digital darkroom was staggering – blurred picture after blurred picture although a lovely set of mesquite branches should there be anyone interested in decorating the walls of their jungle bungalow. 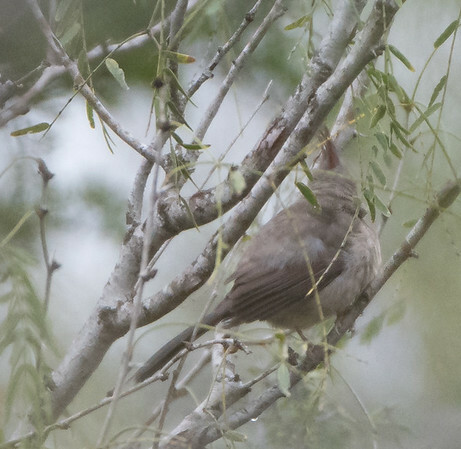 At least two of the shots showed enough of the bird to ID it and officially get me the check. Would have helped a bit if it wasn’t so overcast – a definite theme for that January trip and probably the reason why some of the red highlights were subdued. Here is the only other shot that came out, this one shows the backside. Time to provide some interesting facts about this rather plump bird. First off, it is possible that this female was either with eggs or simply puffed up to give some relief from the unseasonably cold weather they were having down there over the holiday break. I think the mercury barely crested 45 the entire time we were down there. These birds are also referred to as Desert Cardinals due to their preferences for dry habitats. They do tend to move closer to more green areas with water during the winter months. That definitely fits the setting here as the thicket was definitely dense and there was a nice stream moving close by. They are noted for their distinct crests and their thick seed crushing yellow bills. Although they are extremely territorial during the breeding seasons they put their differences aside and congregate for the winter bowling leagues. Probably wondering why the weird name. 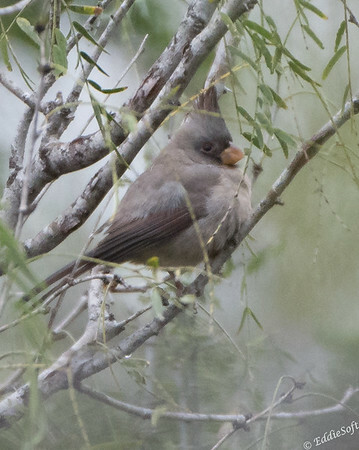 Turns out Pyrrhuloxia is a Latin conjugations of Pyrrhu “peer thru” and Loxia mean “to look/glimpse” in tribute to the fact these birds are so good at hiding in the underbrush that you often must peer through tiny openings in brush to even get a glimpse of them. Public Service Announcement from Brian’s fact checking department. That last fact was total BS and we are obligated to set the record straight. The name comes from the roots of its genus name meaning “flame-colored” and “crooked” (coloring and bill structure). We now return you to your regularly scheduled facts. It probably doesn’t surprise you that they are related to the Northern Cardinal – basically their punk rock cousins. Sorry, not much else to really say about this bird. Hope to get better shots in the future, but happy I was able to get it in the tin being as it is another bird Ron is going to have to travel to catch up on hehehehe. Oh, should probably mention, I was the ONLY person in that entire thicket. The various gang tags and strange foot trails that seemed to head into the thicket and then disappear gave me a very uneasy feeling. Didn’t experience any issues, but my spidey senses were on high alert. That’s the strangest name for a bird I’ve ever heard. I like the Dirty Cardinal or Bird Punk name, or even the Desert Cardinal name, better. Looking for more facts about the Pyrrhuloxia, I read that this name is formerly part of the bird’s scientific name, combining the Latin term for the Bullfinch with a Greek reference to the bird’s bill shape. I see that one of the two types of Bullfinches really does have a “flame-colored” breast. Oh, here I see more details: “The common name Pyrrhuloxia is derived from combining of the names of 2 bird genera, Pyrrhula (bullfinches) and Loxia (crossbills), which are derived, respectively, from the Greek words pyrruos, meaning “flame-colored or red,” and loxuos, meaning “crooked” (Gruson 1972).” So it all fits. Thanks for the new bird with the strange name! Hi stranger! Definitely an interesting bird – wish I could have gotten a more depictive shot of it in the tin, but Mother Nature wasn’t exactly cooperating that trip. I actually almost referred to as a Christmas Ornament with a beak thanks to how plump it was. Probably spending way to much time down at the Mickey Dee’s. Thanks for the additional name roots. My fact checkers gave it the thumbs up so it passed their scrutiny unlike my stab at it. Appreciate you stopping by and commenting!